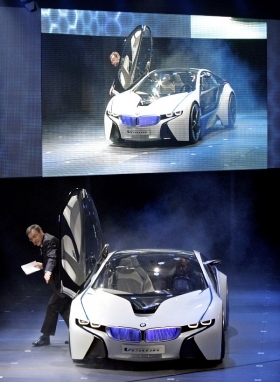 BMW's Reithofer walks out of a BMW Vislovl car at the Beijing auto show. BEIJING (Bloomberg) -- BMW AG plans to sell 20 percent more vehicles in China this year than originally forecast as it rolls out a sedan designed exclusively for Chinese buyers. The automaker will sell 120,000 BMW, Mini, and Rolls-Royce vehicles in China in 2010, compared with an earlier target of 100,000 units, CEO Norbert Reithofer said at the Beijing auto show. BMW sold 90,500 cars and sport-utility vehicles in China last year. BMW, the world's largest luxury-car maker, is expanding capacity and introducing a new extended version of the 5-series model as it challenges Volkswagen AG's Audi for the lead in the Chinese luxury-car market. Audi plans to deliver 200,000 cars in China this year. Reithofer said he sees potential to produce as many as 300,000 vehicles a year in China over the long term. Capacity expansion “will always” lag sales growth, he said. J.D. Power & Associates predicts that rapid expansion may lead to overcapacity in China in five years, with local factories producing at 66 percent of capacity by 2015, below the 80 percent level traditionally required to cover fixed costs. BMW, with partner Brilliance China Automotive Holdings Ltd., is expanding its Shenyang factory and building a second facility for 560 million euros ($744 million). The Munich-based automaker, which began producing 3- and 5-series models in China in 2003, will more than double capacity to 100,000 vehicles by 2012 from 41,000 in late 2009. The company may add production of the X1 compact SUV in China when the second factory opens in 2012. “We are currently exploring this possibility together with the authorities here in China,” Reithofer said. The Rolls-Royce brand said separately today that first- quarter sales in China more than tripled, helping boost global deliveries by 60 percent. Daimler AG introduced an upgraded version of its Maybach ultra-luxury nameplate today at the show. The company is also showcasing an all-new extended version of the Mercedes-Benz E-Class, which like the longer 5 series is designed for Chinese luxury-car buyers, who are typically chauffeured. Audi will show a new longer A8 in Beijing. The introductions underscore the country's importance for high-end automakers as European and U.S. markets struggle to recover from the global financial crisis.